Many think the 1970s cult classic movie Slap Shot is as synonymous with hockey as Wayne Gretzky, Gordie Howe and hockey fights. It is mandatory viewing for any hockey fan. And many fans have, since, believe it or not, Slap Shot is the second most rented movie ever. Slap Shot looked at the rough and tumble world of minor league hockey in unforgettable fashion, often using an explosive cocktail of glorified violence and crazy humour. The adventures and hijinks of the Charlestown Chiefs has spun off two sequels, Breaking the Ice in 2002, and Slap Shot 3: The Junior League, just released directly to DVD. The original Slap Shot starred none other than the late Paul Newman as the foul-mouthed coach, but the stars of the show became The Hanson Brothers. The lovable, entertaining, violent, and bespectacled Hansons were loosely based on three actual hockey playing brothers - Steve, Jeff and Jack Carlson. Jeff and Steve actually play Jeff and Steve Hanson in the movie. Jack Carlson could not meet the movie's filming because he was called up to the WHA for the playoffs. Teammate and buddy Dave "Killer" Hanson stepped in and played Jack. The Hanson Brothers were born. In the movie the happy-go-lucky Hanson Brothers drew big crowds to the rink. When all three retired from their actual hockey careers they came to realize the Hanson Brothers drew big crowds wherever they went. They were treated as heroes. So the trio "put on the foil," the glasses and the Chiefs jerseys and traveled all over the world, raising huge sums of money for local, national and international charities and putting smiles on fans faces everywhere they went. If you have ever had the chance to meet them you know it is truly a case of Hollywood characters coming alive right before your eyes. 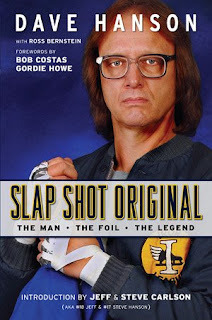 All in all it is a pretty amazing story, one that Dave Hanson tells with bestselling author Ross Bernstein in the newly released book Slap Shot Original: The Man, the Foil, and the Legend. Ross Bernstein is a prolific sports author of over 40 titles, including The Code: The Unwritten Rules of Fighting and Retaliation in the NHL. In contacting Dave Hanson for his thoughts about fighting in hockey, he became enamored with Dave's love of the game and his endless great stories he could share. The two became good friends, and, with the help of Triumph Books, their mutual idea for the book became a reality. After reading through entertaining forewords by Bob Costas and Gordie Howe, the book looks at Hanson's youth and rise in hockey to his minor league days and on to his big league career in the WHA and NHL, where he played with Detroit and Minnesota. Of course Hanson talks lots about the Hanson Brothers and the movies. He gives readers not only a behind-the-scenes look at what life was like on the set during the filming of the classic movie, but also treats them to stories from the actors and players themselves. Some of these stories will leave you in stitches while others will have you digging through your DVD pile to rewatch Slap Shot all over again. After reading this book I have come to the conclusion that the only thing more fun than the on-screen antics of the Hansons was their behind the scenes escapades. The practical jokes, often involving Paul Newman, are hilarious, especially the car crash and naked bus stories. Though the Hanson characters are set in their fictional ways, this book attempts to separate the real Dave Hanson from his Jack Hanson character. Though he has embraced his fictional folk-hero alias, Hanson is, surprise surprise, a real person with a zeal for life, his family, and hockey dreams. He is not to be cast off as an exaggeration of hockey violence like his alter-ego. He is shown as an honourable hockey tough guy, doing a job that is expected of him. This book is worth it just for all the behind the scenes tidbits Hanson shares about the movie, let alone his own amazing journey both on and off the ice. It is an entertaining read, and just under $20. In the 1970's there was a city league hockey team known as the Iron Rangers in Marquette Michigan. Slap Shot came out my graduation from high school. I believe the Carlsen brothers played for the Iron Rangers until recruited for Slap Shot. Also I believe they worked for my father while living in Marquette. Mert and Larry would have been their employers. I woild be interested in speaking with one of the Carlsens. I am also a huge Red Wings fan.